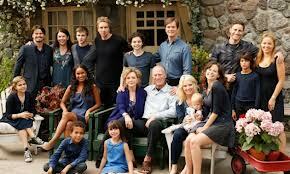 Parenthood is one of my favorites shows so I am excited to watch this season and catch up on all the Bravermans. “Family Portrait” had me cracking up right from the beginning as we find Sarah asking her mother for her fiance Mark to be included in their upcoming family portrait. Camille pulls out an old family portrait pointing to a woman next to Crosby and is firm with her “family only rule.” This may not seem that funny to you, but having grown up with a mother who also had a strict – no girlfriends, no boyfriends, no fiancees in family pics… husbands and wives only; this made me giggle. And even with this rule, my mother would arrange the in-laws so they were on the perimeter. You know…just in case, and then they could be easily trimmed out. Sarah explains this to Mark – blaming this family rule on some old girlfriend of Crosby’s but Mark doesn’t understand since they are going to get married. Mark makes the extra effort by going to speak to Camille about this pleading his case. He loves Sarah, they are engaged, he is part of their family. Meanwhile, Sarah has to drop the deposit off at the photographer played by Ray Romano. Hank is a quirk guy with little to no social skills, but after spotting his Help Wanted sign in the window, Sarah charms him into giving her a chance on the job. The next day she goes on a photo shoot with him, where she proves she has great customer service, but lacks in knowledge about camera equipment. He tries to fire Sarah, but realizes that she does have talent with the people, something he is lacking. Jasmine and Crosby are settling into married domestic bliss. Crosby notices Jabbar praying one evening before going to bed. As his parents they decide to talk to Jasmine’s mother, who is the religious influence on Jabbar. They ask her to please leave the religious decisions up to them, since they are Jabbar’s mother and father. Jasmine’s mother in turn asks what their religious beliefs are. This strikes a chord with Crosy who spends the rest of the episode trying to figure out what his religious convictions are. He asked Camile and Zeke what they believe and Camille is very frank that she doesn’t know what happens beyond this life, so she didn’t pretend to her children to have those answers. Victor, the young boy Julia and Joel adopted last season, is trying to find his place in the family, as Julia bends each and every rule for him so he will feel loved. Max gives Victor a tour of his room and introduces him to all his pets, including Guacamole, his lizard. His does not let Victor hold him, claiming that Sydney and Jabbar can hold him because they are his real cousins. When Max later discovers Guacamole is missing, he thinks it is Victor who took him. Christina calls Julia to talk about it. Finally Joel tells Julia, the message they are sending Victor by letting him do what he wants and not follow rules is that he is not part of the family. Amber now works at The Luncheonette with her uncles, Adam and Crosby. She starts to flirt with the lead signer of a band who is recording there and ends up hooking up with him. Later in the week, his girlfriend drops by to surprise him. She tells Crosby, who at some point shares it with Adam. Adam can’t believe it and feels protective over Amber. When he questions what type of guy would do something like that, Crosby answers it in one word: musicians. Adam kicks the band out of the recording studio. Amber later confronts her Uncle Adam and tells him that she knows he was trying to help, but he has to remember she is an adult and he must treat her that way, especially at work. 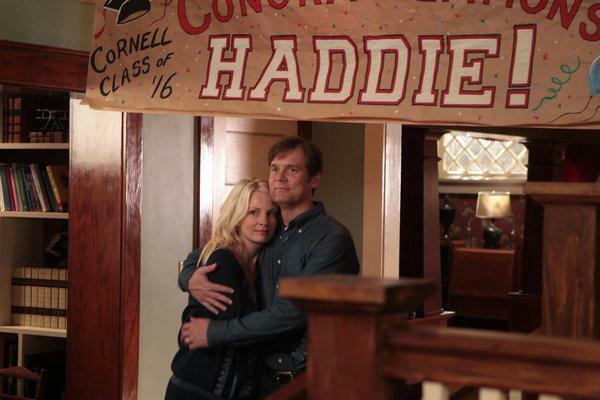 Adam and Kristina are trying to plan Haddie’s final days at home before going to Cornell. Their family of four going to dinner, special time for her and Max, a big get-together with all the Bravermans…it’s driving Haddie insane. The whole family gets together at Camille and Zeek’s to properly celebrate her leaving for college and take the Family Portrait. The final scene was a tearjerker in true Parenthood style. Kristina and Adam take Haddie to the airport. She’s in line to board her plane, but runs back to give her parents once last hug. Here’s the portrait, yes, including Mark.